One of the fastest-growing community festivals to enter the New Orleans music scene since Hurricane Katrina, Bayou Boogaloo takes an already fantastic fest to the next level this year. 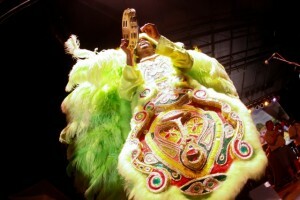 This weekend, May 17 – 19, will mark the 8th annual Bayou Boogaloo festival on Bayou St. John. Not only does the Boogaloo have a pretty fresh VIP experience set up at this year’s celebration on Bayou St. John in Mid-City, but OffBeat has a chance for you to win a pair of passes for this ultimate new way to partake in the Boogaloo right here, right now! 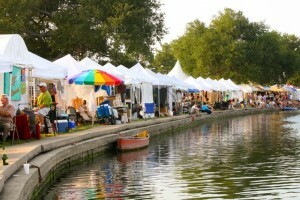 The Bayou Boogaloo lines the banks of the historic Bayou St. John in Mid-City. Local non-profit community organization and founding group of the Mid-City fest, the MotherShip Foundation, has partnered with the music-centric non-profit Positive Vibrations Foundation to bring us the 2013 Bayou Boogaloo, with three stages of local music and several blocks of New Orleans food and art to enjoy. What is unique about the Boogaloo is its location along the banks of the historic Bayou St. John where kayakers and small boaters can easily row right up to the festival, dock and dive right into the festivities where one can relax, enjoy a cool beverage and listen to the music right from your boat+. An interactive children’s area is expanded again and heck, you can even bring your pooch and let ’em cool off in the Doggy VIP. Proceeds raised from Bayou Boogaloo are used to plant large trees along Bayou St. John and around the surrounding neighborhoods that were lost in Hurricane Katrina or due to other reasons. Over 25,000 fest-goers attended Bayou Boogaloo last year, according to festival producers. This year’s line-up features music for a broad variety of musical tastes, including a few rising bands that the OffBeat staff recommends, such as The Honorable South, The Local Skank, Debauche and more. This year’s performance line-up also includescomedy, storytelling and improv from John Calhoun and The Goodnight Show, as well as family yoga, dance, drum circles, acrobats and burlesque. Intermixed with live music featuring everything from zydeco to bounce and everything in-between, the Boogaloo is a bonafide New Orleans experience. 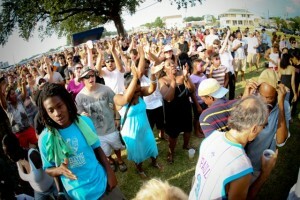 Bayou Boogaloo features 3 stages of local music. 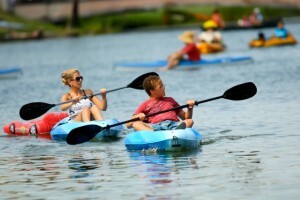 Guests at Boogaloo can kayak right up to the festival grounds, or watch from the bayou docks. As if the music, food, art and location are not already enough reasons to head down to the bayou this weekend, Bayou Boogaloo has partnered with the local neighborhood associations there in Mid-City to make the festival a sustainable and clean one – they utilize “zero waste” practices in producing the event through supply conservation, recycling and waste management, as well as facilitate safe, convenient ways to bike, walk or even kayak to the festival rather than drive to support alternative transit. Other daily VIP packages also available from $30 – $50. *Proceeds from VIP ticket sales keep the festival free and open to the public. 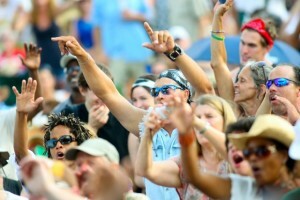 Bayou Boogaloo offers a VIP Experience, in addition to children's, wellness and pet areas. 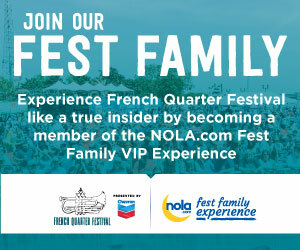 ENTER TO WIN  3-DAY BAYOU BOOGALOO VIP PASSES FROM OFFBEAT HERE! *By submitting this form, you will be added to OffBeat’s Weekly Beat e-Newsletter. Winners will be notified via email by the morning of Friday, May 17, or sooner. Winners will have  hours from time of notification to confirm by Email reply for ticket claim instructions..